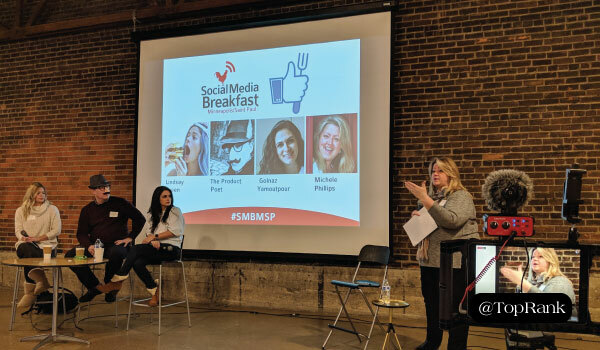 The panel covered insights on finding and working with influencers along with a smattering of great social media marketing tips. Let’s see what they had to say. Who better to tell you about approaching and identifying influencers than other influencers? Golanz has hired influencers herself and stressed looking for influencers who speak to specific audiences. The panel commented on the multiple tools available, but suggested starting with a look at who is interacting with your brand. If someone is already a fan, then you know they’re part of and understand your established audience. Although reach is a consideration for identifying influencers, a broad saturated reach may not capture your narrow or specific audience’s attention. However, micro-influencers often have great engagement and capture more engagement with your potential customers. The Big B2B Takeaway: Your existing audience or network is an influencer identification hot spot. Use social listening tactics and tools to uncover and engage with influencers who are already your fans. Relationships are key to the success of influencer marketing initiatives. Sending a cold email with a “Hey there!” greeting isn’t going to get your far. It’s important to warm up the relationship. The panel encouraged following potential influencers, so you understand who they are and what they discuss on social media. And, this will help with your vetting. But you shouldn’t stop at simply following a potential influencer on social media. You also need to engage with them. One audience member asked if the engagement had to be around their target subject. The answer? No. Any subject someone is talking about or sharing content around is fair game. In other words, start a conversation and foster a relationship. The panel agreed that the more personal the better, so when you have an engagement ask, it is not out-of-the-blue. The Product Poet illustrated the personal touch with a story about staying at and engaging with Hilton hotels. He learned Starwood, Hilton’s parent company, was taking notice. On a trip to Atlanta, he walked into his room to find a brilliantly written poem, which included personalized information, a gift certificate to a BBQ restaurant, an Uber gift card to get to the restaurant and a gift for his dog Charlie. Wow! The attention to detail blew him away. And, of course, he had to share the amazing gifts and story on his social channels. The Big B2B Takeaway: Work hard to develop real relationships with potential influencers. That means going beyond the social media surface to understand who they are, what excites them, and what motivates them. This will help you have more meaningful interactions from the beginning, and make collaboration more appealing when it comes time for the ask. Perhaps the most uncomfortable part of influencer relations is discussing compensation for paid partnerships. How much should you propose? What’s reasonable? What can you actually afford? If you’re entering a paid partnership, ask influencers early on if they have a rate sheet or media kit. This will allow you to see if they fit into your budget from the outset or if negotiations are needed. The savvy negotiator gathers all the information first. Lindsay commented that a good paid influencer should share how they plan to promote your product and share an example of what you can expect. And, it should include analytics on how their posts perform. Remember, this is a relationship, so honest, open communication is a must. As part of a paid agreement, it is important to outline who owns the content and what is fair use. The Product Poet reminisced on a blog post he wrote about a restaurant. That restaurant re-posted his blog without permission. He would have given permission, but now he will not promote their food. The Big B2B Takeaway: Whether you’re paying influencers for their collaboration or not, define your scope and expectations early on to avoid slip ups later on. In addition, don’t be afraid to ask influencers for examples on how they’ve done thought leadership work in the past. When you have a panel of social media stars, the audience wants to know how they make social work for them. The panel encouraged us to play with all types, but post more video on all of your channels. They believe the trend of video-centric algorithms is not going away anytime soon. Your mobile device is a great video marketing tool. Lindsay reminded us that it’s easy to create great videos on your phone and make a few edits in iMovie or Adobe. She encouraged making a thumbnail cover photo that best represents your video for the still cover frame, and the FaceTune app is great for making that cover image look great. Optimize your YouTube videos. YouTube video posts support a longer form video, because the audience is more prone to stay on a channel for more than 30 seconds. As a member of the Google family, search optimization comes into play. Lindsay said she researches the appropriate keywords, so her channel and videos rise to the top of the search. Know your video options across platforms. The Product Poet says you might be surprised to know you can post up to a 10-minute video on Twitter, subject to file size, through the business video suite. But, on Instagram, you should stay to under 30 seconds. Apply SEO knowledge to hashtags. An interesting tidbit in choosing hashtags also applies to Google keywords. You may be inclined to pick the hashtag with 1 million shares. But, consider choosing one that has fewer shares that might be more specific to your content – just like a long-tail keyword. The Big B2B Takeaway: Video isn’t going anywhere anytime soon. So, if you haven’t dabbled yet, there’s no time like the present and the barrier to entry isn’t as high as you may think. In addition, when it comes to maximizing your video and content exposure know your platforms and don’t forget about SEO best practices. When it comes to working with influencers and achieving success on social media, B2C has had a jump start. But the good news is that B2B marketers can learn from the challenges and successes of B2C, which means you can take a step back and apply these well-honed insights into your own campaigns. My biggest takeaway? It’s all about building relationships. Whether you’re looking to work with influencers or you’re trying to get more visibility or engagement on social platforms, you need to be relevant if you want to resonate.